With globalisation, education has taken on a value that just cannot be measured and calibrated. Education, which, after all, is only a synonym for learning, has become one of the basic necessities of life after food, shelter and clothing. However good a teacher may be, unless the learning process is understood clearly and unless there is a motivation on the part of the student to absorb and retain what is being taught, all efforts to impart learning and wisdom will be futile. 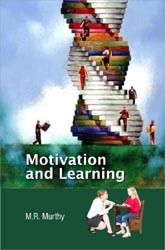 This book has been produced to enable students and teachers to understand the theories and methods of learning and the psychological factors that lead to a positive motivation. The chapters have been chosen to ensure that the reader gets a complete picture of the processes and techniques of learning and the methods by which the correct motivation can be built up to ensure success in every walk of life. The chapters include: ¨	Perspective and the Problem of Motivation Interaction ¨	Extinction, Inhibition and Differentiation Learning ¨	Understanding Learning and Memory ¨	Understanding Motivation ¨	Management of Mood and Effort ¨	Time Management ¨	Learning from Textbooks ¨	Learning from Lectures ¨	Motivational Processes ¨	Intention and Kinds of Learning ¨	Habit Activation in Human Learning ¨	Future Achievement of Motivation and Learning Students in all subjects and of all levels as well as teachers and researchers in education, psychology and teaching methods will find this book a useful aid to develop not only teaching ability but also learning skills.